From a pedagogical point of view, it did not matter to me whether or not acting really begins in silence in the training of professional actors. Different schools of acting would say that acting begins with emotion, or motivation or even in chaos. What is important is why acting should begin in silence for children. It is fitting to put the practice of Silence and Mindfulness at the very foundation of a child’s introduction to performing, and performing regularly should be part of every child’s education. We teachers want children to experience that “inside” world of their feelings, thoughts, voices, attitudes, imagination. The inner world, made accessible to children, is an invaluable resource for their learning. Silence is an essential technique to lead children towards their inward experience of themselves. We want growing children to establish a “center,” “focus point,” “personal reference space” that they can return to over and over again during class, if not also during their lives. 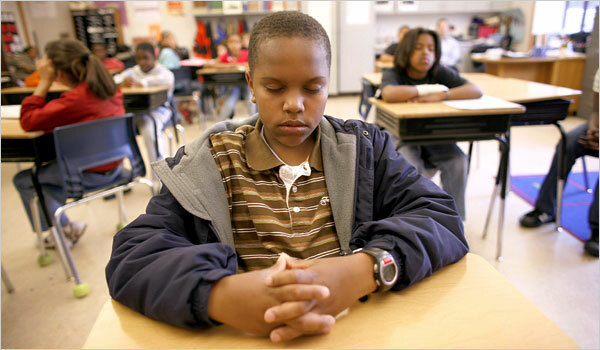 The establishment of Mindfulness into the instructional culture of your classroom allows you to approach Classroom Management more as an acting coach than an embattled classroom teacher. When children are “out of themselves,” as they typically get after lunch and unbridled recess, then you are empowered by your pedagogy to get them back “into themselves.” The issue becomes one of children’s energy rather than their behavior. So with trains clattering over Westchester Avenue, garbage trucks grinding gears, ambulances and police cars blasting sirens through traffic, airplanes ascending from La Guardia, I would teach children Mindfulness in the heart of the South Bronx. At PS 130, I learned to tell the children that, ultimately, we cannot control the world outside us, but we can always control the silence within ourselves. If we cooperated in our own silence, I would suggest, we can influence the peacefulness immediately around us. My own training in Mindfulness is the practice of the Vipassana meditation technique. Here are some poems I wrote from the experience of meditation and Nature at a silent retreat in North Fork, California. Rain. Full moon behind clouds. Why come all the way to California? This is like Massachusetts in April. Sunny with a chill. Hope. Clear blue days. Mornings crisp. Nights cold. California afternoon dries my washed shirt in two hours. Like mental activity just below the surface. Like a fine thought, wings and feet land on a branch. The empty branch is framed by my window. The meditator prepares his pillows. Take up perches on rocks, stumps, the edges of the concrete patio. All facing in all directions where the sun strikes. This entry was posted on Sunday, July 31st, 2016 at 8:05 pm	and is filed under Education. You can follow any responses to this entry through the RSS 2.0 feed. Both comments and pings are currently closed. Thanks so much for this, Howard. A great note to finish up the weekend of the 4th of July! I totally agree, so well put. I’ve been using silent processes, for many years with all ages, including visualization and listening exercises/games. Teaching Acting and Speech now for a long time on the college level, I begin with exploration of non-verbal communication as the central core/first foundation to build and develop. I too, remind students that no one controls you, but you, that you are the master of your reality onstage or off -that concept you identified is so very important for all of us to remember; thanks. Love that line, ‘comic rodent nature’; very funny. I’ve been writing and performing poetry since the early ’80’s; I appreciate your poetic perspective very much! Looking forward to the Classroom Management workshop here in NY next week. I am so inspired by your message today. Getting students to center is key. It is their own voice which will ultimately guide and teach them. I enjoyed reading the article, and hope one day I will have an opportunity to introduce Mindfulness to a drama class. After teaching Drama and Music for 12 years, I have been ordered back into the classroom as there is no more money for dramatic arts programs in the New York City schools. Always great to hear from you. Glad to see you’re still involved in the good fight. Enjoyed checking out the site. Great to hear from you. It’s not an either/or type of scenario with student testing (i.e., either we do away with testing or we do away with holistic, comprehensive education). I think it’s important to keep teachers accountable in order to weed out the bad ones that hinder students’ growth but you’re absolutely right that it’s also important to make other subjects/areas of learning/activities a priority (as you remember, I did several plays with my classes and took them on field trips all over NYC each year that connected with the themes that they working on). Having said that, do you think it’s possible to hold teachers more accountable (i.e., administer standardized tests) without placing such an emphasis on teaching to the test? That is, allow teachers to do more of what you are advocating, but still test the students in the middle/end of the year to determine the growth/improvement they have made? CERTAINLY TEACHERS SHOULD BE ACCOUNTABLE AND PRINCIPALS SHOULD DETERMINE AND CULTIVATE GOOD TEACHING— USING A VARIETY OF MEASURES BASED ON A TEACHER’S POSITIVE INFLUENCE OVER CHILDREN’S LEARNING. A NUMBER IS A SIMPLISTIC MEASURE FOR THOSE BUREAUCRATS WHO ARE UTTERLY IGNORANT ABOUT WHAT TEACHING AND LEARNING MEAN IN THE CLASSROOM. NOT HAVING ACTUALLY TAUGHT CHILDREN AT ALL, OR FOR ANY SIGNIFICANT LENGTH OF TIME, THEY HAVE NO IDEA OF THE COMPLEXITY OF ASSESSMENT. THEY PROTECT THEIR IGNORANCE BY ASSERTING THE AUTHORITY OF THEIR NUMBERS. OUR SCHOOL SYSTEM SUFFERS FROM A CULT OF NUMEROLOGY— EDUCATIONISTS WHO BELIEVE THAT NUMBERS HAVE MYSTICAL POWERS IN REVEALING THE TRUTH. FROM WHAT I SAW IN YOUR CLASSROOMS, CHILDREN WERE ENGAGED BECAUSE OF YOU. YOU HAD YOUR OWN RITUALS, ROUTINES AND YOU SPENT HOURS PREPARING WAYS TO RELATE YOUR INSTRUCTIONAL GOALS TO THE ACTUAL CHILDREN IN YOUR CLASSROOM COMMUNITY. BECAUSE YOU WORK SO HARD AND ARE RELENTLESSLY DEDICATED, YOUR KIDS WERE BOTH HAPPY AND SUCCESSFUL, EVEN IN THE CURRENT SYSTEM. WE MUST ALSO GIVE CREDIT TO DANNY GARCIA, PRINCIPAL OF PS 130. HE WAS A TERRIFIC EDUCATIONAL LEADER WHO DID NOT NEED NUMBERS TO HELP HIM PICK OUT GOOD TEACHERS. Thank you for the information and your vivid poetry. Have you read “Mindful Teaching and Teaching Mindfulness: A Guide for Anyone Who Teaches Anything” by Deborah Schoeberlein and Suki Sheth? This coming school year I will be teaching a 5th grade 12:1 class at P.S. 152 in the Bronx. This past school year I taught a 5th grade Integrated Co-Teaching class. My pedagogical mentor is Rafe Esquith, and having read all of his books many times and watched the documentary about his class repeatedly over the last 4 years, I finally had enough courage to do Shakespeare with my class. I chose A Midsummer Night’s Dream and cut it down to an hour. The children had four weeks to rehearse the play, but with changes in schedules and state audits, four weeks turned into three weeks. Whether it was going to be four or three weeks, I knew it wasn’t enough time for the students to get everything out of it that I would have liked, but just enough time for me to feel totally incompetent and completely insane for undertaking such a task. I learned most of their lines to show them that it wasn’t impossible to memorize their lines and worked with them during lunch and prep periods. I thought that if I showed them that I was working hard, then they would work hard too, but day after day they came back having barely memorized their parts. I gave countless pep talks trying to inspire them, but feeling utterly defeated. Then a few days before they were to perform for the parents and another class, the children arrived telling me that they had learned their lines. Most of them had and were doing an incredible job. For the meager amount of time they had to prepare, their performances were wonderful. I know I didn’t give them enough time to undertake such a challenging project, but I know they learned a lot. They certainly learned new vocabulary and are able to quote Shakespeare, not to mention that they had a lot of fun and learned a bit about acting. I wanted them to learn more about the importance of teamwork and respect for one another, but next year I will place greater emphasis on those goals. The best part is that they are able to incorporate Shakespeare into their everyday experiences. During the last week of school, I overheard a young lady in my class becoming annoyed with a young gentleman and she exclaimed, “Thou drivest me past the bounds of maiden’s patience!” That moment alone was my reward, though several others occurred and were just as rewarding (not all of them conflict situations). I can’t wait for the next school year to start. YOUR STORY IS PRICELESS. IT’S THE KIND OF EXPERIENCE MOVIES ARE BASED ON. CONGRATULATIONS. Howard, as always – thank you for your work! As always, you are so wonderfully poignant in preaching for quality learning and teaching. I’m always inspired by your message. When I was first teaching myself how to teach string programs in public schools, I used the message of hope: ” Music begins in silence”. Mostly, a hush would ensue and I very happily found those words were an effective way to bring the children into themselves and ready to listen not only to me, but to themselves and others around them. Can’t wait to meet and learn about other teachers and the students they teach. Howard, thank you, thank you!! I love your spirit and your determination to keep the arts alive. Thank you! Practicing meditation is a really rewarding exercise to get a more relaxed life. I know it saved me and kept me happy no matter what happened.